I guess Easel files don't have a "format" yet. Would you want SVG or .esl (just made that up), something else? Ha! Yea I was just curious what you were thinking. It's gonna get tricky when we add 3D natively in Easel because SVG isn't the best format to store 3D files in. I would like to see STL files. My understanding is STL files describe only the surface geometry of a three-dimensional object without any information on color, texture, material, bit used, on the path, outside, inside etc. Also I don't think here is any scale information, and the units are arbitrary so importing back to in or mm would be on the user to get it right. My understanding is this will be part of the new API. I think the existing apps will either be backwards compatible or there will be a one time conversion. There was talk about an offline mode but there are some serious complexities that need to be considered. Google has struggled with offline mode for google docs. I don't understand what makes it such a hard problem. It might have to do with getting out of sync and how that is reconciled. Most purchased models for cnc carving are in STL format. The models are dimensionless, so you need to know what units it was created in. 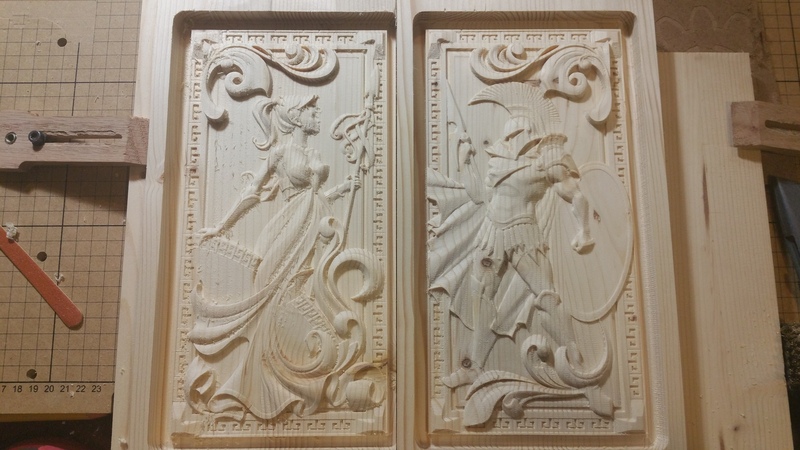 There are some amazing models CNC ready for sale all over the internet. Can you post a few links so I can check it out? You can find thousands on ebay as well...a search for "stl models" will give you a few to look at. I would think a file from easel would have to include not just the svg, but also the material dimensions and wood type, bit and cutting parameters, tabs and placement, etc, if local storage were what you were going for. I would be happy with just folder storage in the easel environment, to be honest, but I never have the problem of wishing for offline work capabilities like some others might, because I have Internet coverage just fine in the shop. Agreed. Though I wonder if I would fall I to the unscrupulous category, or the simply stupid? This is not so much of a problem with small less important files but when I spend 2 hours setting up my machine and then perform a 15 hr cut this can pose a huge problem so in that case I would download the easel file and run it local on my computer I am not sure but is there a way to get easel local on the computer ? Easel carves without the internet. You only need the Internet to save or load a new file. I have seen this come up a few times. And can. It agree more. I also have multiple multiple projects. And it is getting to the point where I don't want to start new projects. Because it will make it that much more difficult to find older ones. Any way to organize it, locally or in easel itself, would be great. Even without local saving or file types. A way to have a click the button top left corner->click folder(Star Wars projects)->and be able to move all Star Wars into this folder. Then have others. Would be the best first step. IMHO. How does the code in the browser hold the information that makes up a project? A hierarchy of js objects? If so, couldn't you dump that to json files for download? I would build up a hierarchy system very much based on the standard files and folders system that people are used to. Use the standard naming, New Folder,delete etc. This should make everyone no matter their OS feel at home. I personally don't really care about having offline access, and would prefer the time and energy be put elsewhere. As a Dir of Engineering in the medical field, I look at every single feature, and although it may look simple today, it has to be tested, documented and maintained for it's life when it is released. Nothing is simple or free. @Andy4us you said it brother "nothing is simple or free". What happens if there is only 1 file in the project? To me, this makes the most sense. In the project sidebar (where recent projects are shown ) have only folders and projects. Folders can be multiple deep, e.g. Since this could be it's own sidebar, it could be hidden for a simple operation, one file and bit, e.g. the Carvey user, and then expanded for a more power user. @Zach_Kaplan IMNSHO (e.g. "my opinion"), for archiving an easel project, the Easel developers get to decide on the file format, this is not an exchange (import/export) scenario, it's "merely" backup and restore. That said, you have to keep in mind that you will want to change the format at some point, so you have to be rigorous about being able to restore from really old project backups into newer versions. Also, less proprietary is usually good, maybe a combination of formats, zipped up. So portions of the data that align well with an existing format, use that existing format, and tie the files together with a control file. As a totally made up example, say that .SVG or .STL was "the perfect" format for representing a single layer of an Easel project, but totally inadequate for representing all the project data and relating the layers to each other. In this case, perhaps a single .SVG or .STL file per layer and an XML file that references all the layers, along with project details that are specific to Easel.